In late 2017 we had penned a rebuttal to the claims regarding the 2016 Rafale deal that had emerged during a particularly heated state election campaign and for a few months, it appeared as though these fictitious claims had evaporated. However, in it is now March 2018 and sadly we are back square one and these accusations are running rampant, again occupying an inordinate amount of attention in political discussions and columns in newspapers. We would thus like to reaffirm the sheer absurdity and fallacies of these claims and hope to have a comprehensive document that can be used to refute any continued efforts to compromise our national security by undermining this deal and any subsequent deals. It should also be noted that the 2016 Rafale deal was for highly advanced versions of the Rafale (F3+) highly customised to operate in Indian conditions whereas the version being negotiated under the original MMRCA (Medium Multi-Role Combat Aircraft) was the F2 version minus any Indian specific upgrades. So we can see from the above that there is no deviation from the stated figures for the deal, every single penny is accounted for. Let’s debunk some more claims, how about the fact that India paid more than the other export customers for the Rafale. So even though India signed its deal at a later date than the other export customers, when the INR value was significantly higher, it was able to pay less per unit than either Egypt or Qatar whilst at the same time being able to secure a 50% offsets package that will mean that the French side will invest fifty percent the value of the entire deal back into India. Additionally, the IAF (Indian Air Force) deal includes far superior jets to those of the Egyptian and Qatari air forces that are customized to Indian conditions. 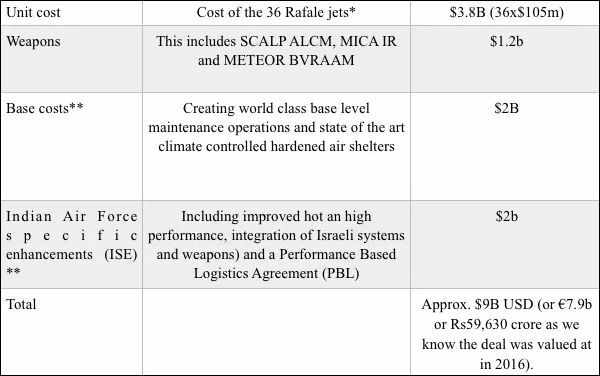 Significantly, points of departure from the original MMRCA deal that the UPA had first proposed in 2008 and the NDA’s Rafale deal includes the addition of the world-class weapons systems such as the feared METEOR beyond visual air to air missile (BVRAAM), perhaps the world’s most deadly BVRAAM with a range in excess of 150km and the SCALP air-launched cruise missile (ALCM). Additionally, the NDA was able to secure 50% offsets as opposed to 30% for the MMRCA, the inclusion of a PBL and perhaps most significantly technical assistance for India’s troubled turbofan project, Kaveri. With a fifty percent offset obligation under the NDA deal the French side will be investing almost €4 billion into India. This vast sum of money that will benefit the nation’s aerospace industry immensely and a portion of offsets will be invested in a new joint venture between DA (Dassault Aviation) and Reliance defence; DRAL (Dassault Reliance Aerospace Limited). DRAL will not only create massive job opportunities at its newly constructed greenfield facilities in Mihan but will provide a dedicated localized supply chain for the Rafale on Indian soil. Another exceptionally beneficial point is the news that DA intends to place DRAL inside its global supply chain for their world-renowned business jet, Falcon. Thus, India will be in the possession to be part of yet another globally recognized “Tier 1” supplier in the lucrative aerospace industry. Based on news reports it is clear that the original mandate of MMRCA wherein a dedicated fighter jet production line would be set up locally is still a possibility– as long as India orders more Rafales. This would involve expanding DRAL’s facilities into a standalone Rafale production line with the capacity to produce 16-18 Rafales per annum. This would see India create its first ever aircraft production line outside of the public sector, and here again, the deal diverges from MMRCA as the original MMRCA plan was for HAL (Hindustan Aeronautics Limited) to receive the contract for local assembly. For seventy years India has been without serious capacity in the aerospace industry within the private sector that extends beyond sub-assembly production, this is all set to change within the next few years and the ramifications for this cannot be understated. Creating a competitor to HAL in India assisted by one of the world’s premier OEMs (Original Equipment Manufacturers) will have lasting effects for generations to come. The 2016 NDA Rafale deal includes a comprehensive Performance Based Logistics (PBL) agreement wherein Dassault Aviation (DA) is legally obligated to assure that 75% of the IAF’s Rafale fleet is available for operations at any given moment in time. For comparison, in 2015 the IAF’s SU-30MKI fighter fleet had an availability rate of less than 50% (now should be closer to 60% thanks to measures sanctioned by former defence minister Manohar Parrikar) and the Indian Navy’s premier fighter, the Russian-built MiG-29K, had even lower availability rates than this. The French are already working to assist with the DRDO’s advanced but plagued turbofan engine, Kaveri, with a view of completing the work so as to be able to fit into a number of current and future platforms that will be both manned and unmanned. The French engine manufacturer, Safran, indicated that 25-30% more work would be needed to make the Kaveri flight-worthy. According to the deal being offered, India would not need to spend any more developmental money on the project and Safran would take on the investment around EUR 1 billion to revive India’s Kaveri project committing to make the Kaveri flight-worthy within 18 months. The proposal is to integrate the upgraded Kaveri with the Mk-1A version of the Light Combat Aircraft by 2020. Furthermore, the NDA Rafale deal was also able to secure an agreement to train the first batches of IAF pilots and ground technicians in France free of cost with an additional guarantee for 60 hours of usage of training aircraft for Indian pilots and six months of free weapons storage without charge. With the significant investments made by the IAF for their Rafales, it would be truly unthinkable that the number would be capped at 36 or even 72 units. For the enormous customisation and basing costs to be justified significant follow-on orders need to be placed but there is no doubt that such orders would benefit immensely from these new conditions. The Indian Navy, in particular, is now in a strong position to take advantage of the investments made by the IAF as they could pool training costs, spares management and operational procedure. To fail to take advantage of such investments by selecting another foreign fighter for the navy or perhaps an even more unjustifiable purchase such as a foreign single-engine jet fighter would be unpalatable and a true insult to the Indian taxpayer. Every single penny is accounted for, the deal abides by the contours of DPP-2016 and we can categorically state that the deal the present govt signed was superior to that of the one that had been proposed under MMRCA as the technical benefits specifically for the Kaveri and LCA projects are immense. Under the MMRCA deal, there had been no such obligation to support local strategic projects. Furthermore, there are strong rumours that the confidential IGA (Inter-Governmental Agreement) signed by the two governments in January 2016 contained an understanding that France would assist in a number of strategic projects of India that go far beyond aerospace. The biggest drawback of the NDA’s Rafale deal is that such few orders were placed; 36 against a total requirement of 189 units (126+ 63 unit follow-on clause). This can be addressed by additional follow-on batches but this has yet to be solidified and with each passing day the IAF’s existing strength depletes further. It should be noted here that the French officials as senior as the French President and CEO of Dassault Aviation, Mr Eric Trappier, have as recently as the 10th March 2018 reiterated that India’s Rafale deal is fully compliant with Indian and French laws and procedures. Critically, the most significant difference between the MMRCA deal and NDA’s Rafale deal is that the latter is a pure Government to Government (GTG) deal. The significance of this is that a GTG, as opposed to a commercial deal, involves the governments of India and France and their relevant ministries coordinating with each other to come to an agreement on the sale of military equipment. As such, in a GTG deal, there is no scope for “middlemen” or graft and all agreements have to abide by the most stringent conditions and scrutiny imaginable given the fact that the prestige and credibility of both nations are at stake. Political mudslinging may have become the norm across the political landscape and thus many may have become desensitized to such nefarious campaigns, however, when it comes to defence procurements, these intellectual arguments can have a very real and very damaging effect. Let us not forget the lessons of the past. The Bofors scandal had a lasting impact far beyond the political cost to a particular political party, from the year the last FH77B gun had been inducted into the army (around the late 1980s) until this very year not a single artillery piece had been ordered, meanwhile, India’s enemies had been able to procure thousands of very sophisticated systems. It should not be forgotten that these controversial weapons were declared “saviours” during the 1999 Kargil war but the availability of such weapons was found insufficient. It would be beyond unfortunate for us to encounter such a situation again, where we all are the baby to be thrown out of the bath water and where we find ourselves in need of vastly more Rafales at the exact moment when we need them most. The accusations against the 2016 Rafale deal whilst clearly devoid of any merit perhaps mark a low point in the political discourse our country has encountered in recent times as not only does this unfairly penalize our own military’s efforts to modernize but as this deal is GTG it puts relations with one of our most critical strategic partners under undue strain as it is an attack on the character of the French military export procedure mechanism. Thus the fallout could not only be harmful to our own military but to our strategic interests.